ParkDC is an initiative by the District Department of Transportation (DDOT) to manage and regulate the District’s curbside and parking assets. The District Department of Transportation (DDOT) announced enhanced enforcement is set to begin in the Dupont Circle Nightlife no parking pick-up drop off zones on and around Connecticut Avenue NW. Starting Thursday, August 30, 2018 vehicles parked in the zones and not picking up or dropping off people will be towed. DDOT launched the nightlife pick up drop off zone October 2017 in concert with the Golden Triangle Business Improvement District, the Metropolitan Police Department, and the Department of Public Works. The pilot program has been well received and with the support of additional enforcement in the area operations are expected to continue to improve. The pick-up drop-off zones are designed to address traffic and pedestrian safety concerns generated by the growing late-night activity at Dupont area restaurants and bars. 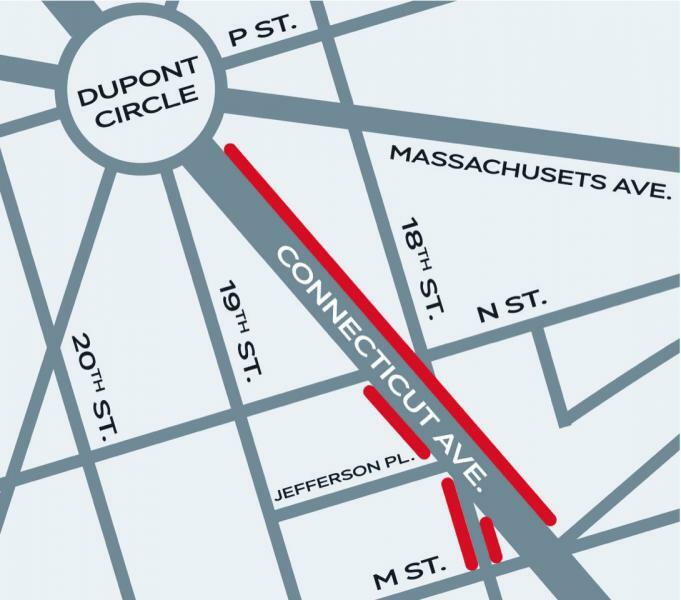 The pick-up and drop-off zones are available during evening hours from 10:00 pm to 7:00 am on Thursday, Friday and Saturday nights along Connecticut Avenue NW from Rhode Island Avenue NW to Dupont Circle (see map). Parking meter rates are adjusted quarterly in the Penn Quarter and Chinatown neighborhoods as part of a performance parking program to improve parking availability through demand-based pricing. The rate changes include all metered on-street parking spaces within the area bounded by H Street NW, 3rd Street NW, E Street NW and 11th Street NW. For more information on the current rate structure and how to pay for parking in Penn Quarter/Chinatown, see Demand-Based Parking in Penn Quarter/Chinatown. The demand-based pricing started as the parkDC: Penn Quarter/Chinatown Parking Pricing Pilot from 2014 to 2018. DDOT released a final evaluation report on the pilot in January 2019. Goals: To manage and regulate the District's curbside and parking assets.